Biking over the Dronning Louises bridge, which separates Peblinge and Sortedams lakes. Prada jacket and bag, Michael Kors pants, Tod’s sneakers. In Copenhagen, a crew of fashion influencers is helping put their country back on the design map. 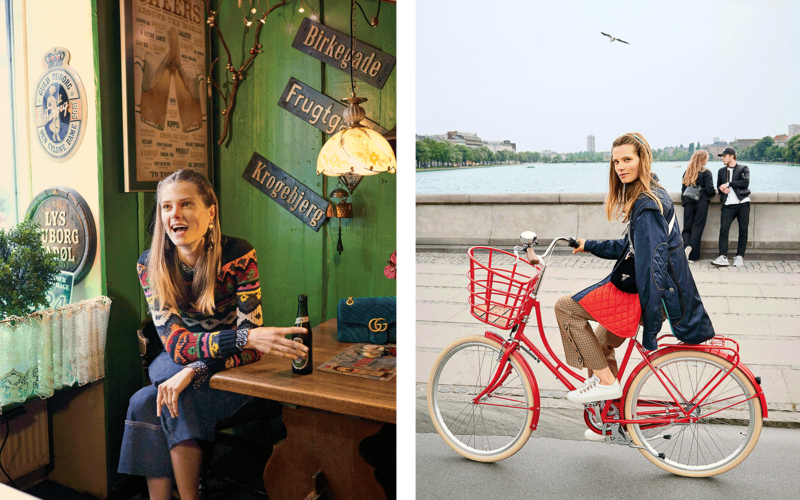 Wearing highlights from the fall collections, model Caroline Brasch Nielsen gives us a tour of her stylish hometown. 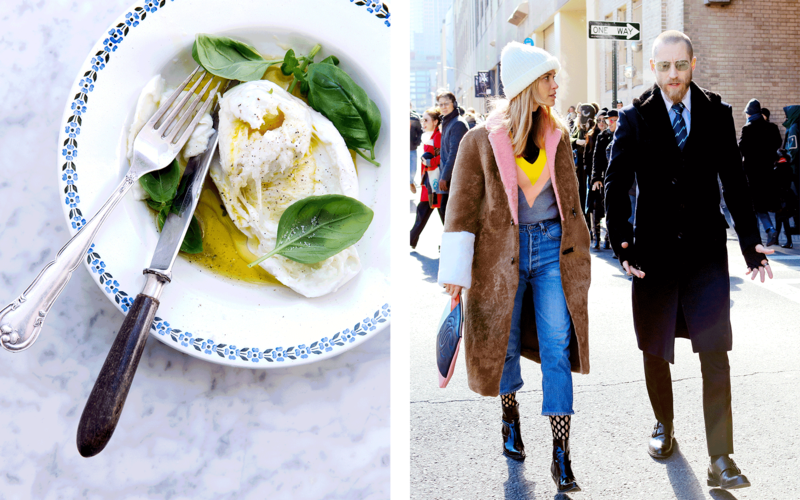 There was a moment during New York Fashion Week last February when, from out of nowhere, it seemed everyone was talking about Copenhagen—and not for the usual reasons. 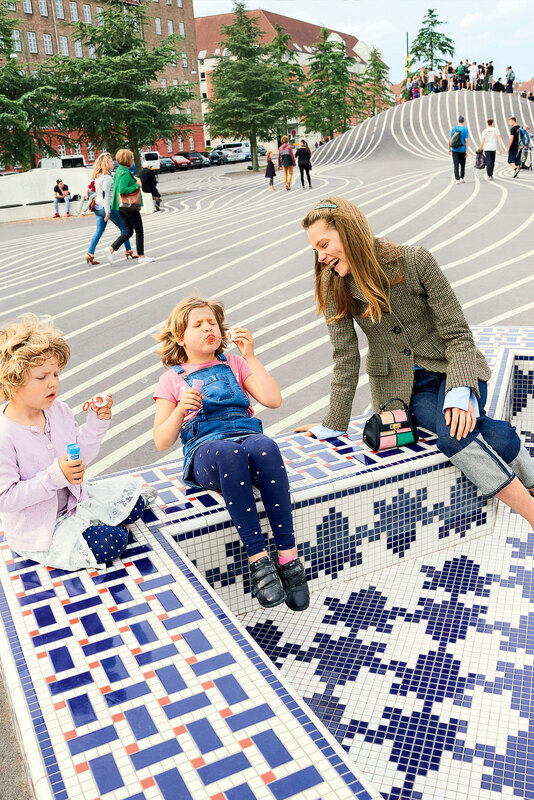 For once, it wasn’t the Danish capital’s exalted quality of life, or its much-hyped New Nordic cuisine, that the assembled stylists, bloggers, and fashion editors were whispering about. A cycling and skateboarding ramp at Superkilen park, in the residential Nørrebro district. Miu Miu blazer, Sea blouse, Rag & Bone jeans, Salvatore Ferragamo bag. 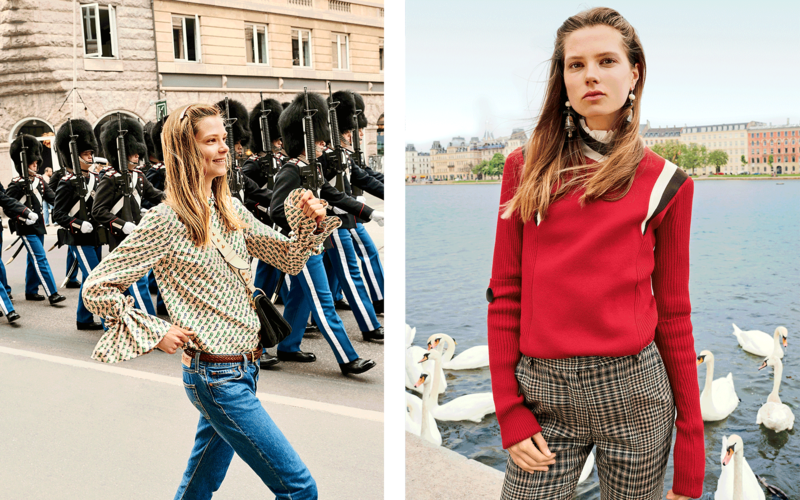 None of this was news to model and Copenhagen native Caroline Brasch Nielsen, who shows off T+L’s pick of the fall collections on these pages. Having been the face of Marc Jacobs and Valentino, Nielsen has become part of a group of fashion influencers who are exporting Denmark’s experimental sense of style around the world. That community includes “it” jewelry designer Sophie Bille Brahe, blogger Pernille Teisbæk, models Frederikke Sofie and Nadja Bender, and hairstylist Cim Mahony, whose elegant, light-filled salon has become a hangout spot for the city’s fashion crowd. The story of how Copenhagen became the surprise star of the season began with a coat. Specifically, the Febbe: a teddy-brown shearling number with pastel panels, designed by a young local duo called Saks Potts. Playful and unexpected, the piece leaped out at the street-style photographers looking for standouts in a sea of black and gray. Within hours of insiders like Weiss, Instagram’s Eva Chen, and Leandra Medine of Man Repeller being pictured wearing the Febbe, it became an immediate sellout. Since then the coat’s designers, Barbara Potts and Cathrine Saks (age 22 and 23, respectively, and both still in college) have become firm fashion industry favorites. When they’re not traveling to London, Paris, or New York, Saks, Potts, and their fashionable clique can be found catching up over breakfast at coffee shops like Prolog, in the meatpacking district; cycling on the shores of Peblinge Lake in their trademark sneakers and colorful socks; or picking out unusual pieces at central Copenhagen boutiques like Holly Golightly. Right: Caroline Brasch Nielsen on the banks of central Copenhagen’s Peblinge Lake—a popular spot for a walk or a bike ride. Marni sweater, Rebecca Taylor blouse, 3.1 Phillip Lim pants, Altuzarra earrings. Left: Opposite: Marching with the Queen’s Royal Life Guards, en route to the changing of the guard. Salvatore Ferragamo blouse, Levi’s jeans, Prada bag. Model’s own belt. 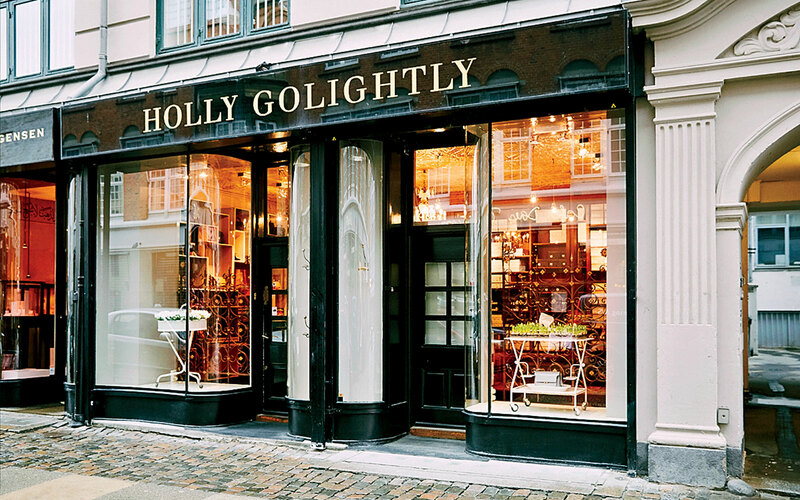 Holly Golightly is where the in-crowd goes for “the best brands— Proenza, Dries, Marni,” Nielsen says. Right: Barbara Potts, of Copenhagen’s hit fashion label, Saks Potts. 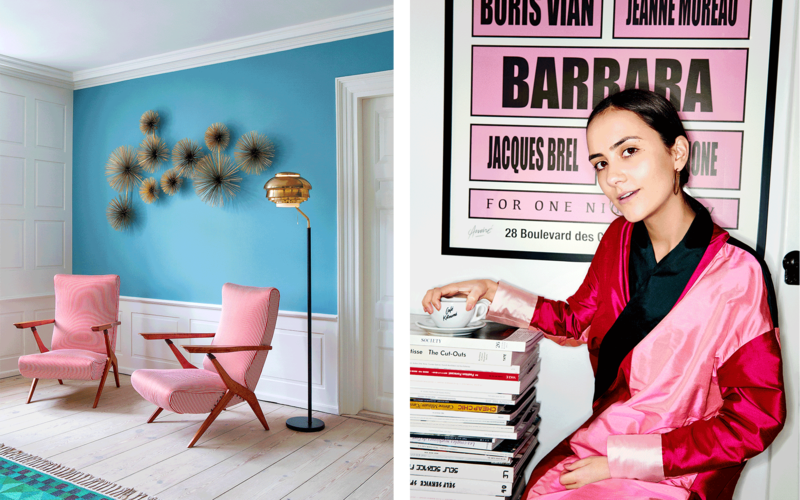 Left: The Apartment, an interiors boutique known for 20th-century furniture in unexpected shades. Right: A beer at Freddys Bar, in Kødbyen, the meatpacking district—home to some of Copenhagen’s most fashionable restaurants and cafés. Red Valentino sweater, Altuzarra blouse and earrings, Fendi jeans, Sophie Bille Brahe necklace, Gucci bag. Hair by Mie Harritz at Studio Cim Mahony; makeup by Lou Ditlevsen/Agentur CPH. Left: Biking over the Dronning Louises bridge, which separates Peblinge and Sortedams lakes. Prada jacket and bag, Michael Kors pants, Tod’s sneakers.